The Philadelphia Big 5 has announced that six individuals will be inducted into the Big 5 Hall of Fame in a ceremony on Monday, April 16 at The Palestra. This year’s class of inductees includes the late Rasual Butler (La Salle), Pat Calathes (Saint Joseph’s), Candice Dupree (Temple), Natasha Rezek (Penn), Curtis Sumpter (Villanova) and longtime Saint Joseph’s Director of Athletics Don DiJulia. The Hall of Fame induction is part of a season-ending banquet honoring the year’s outstanding coaches and players. Butler scored 2,125 points for La Salle from 1998-02, which still ranks fourth in school history behind three other Big 5 Hall of Famers (Michael Brooks, Tom Gola and Lionel Simmons). As a junior, he was a preseason candidate for the Wooden Award and led all Philadelphia Big 5 schools for the second consecutive season with a 22.1 scoring average. 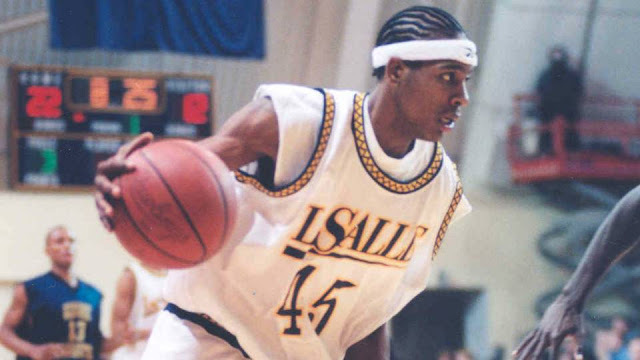 Following his senior year, the Philadelphia native and Roman Catholic High School product was drafted in the second round of the 2002 NBA Draft by the Miami Heat. A three-time All-Big 5 selection during his collegiate career, he went on to a lengthy 13-year career that included stints with eight different franchises. Butler passed away tragically in an automobile accident on January 31. Calathes led the 2007-08 Hawks in scoring with 17.5 points per game as well as rebounding (7.5) and blocked shots (1.2) as Saint Joseph’s went 21-13, reached the Atlantic 10 Championship game and earned a bid to the NCAA Tournament. The 6-10 guard was a two-time selection to the Atlantic 10 All-Conference Team, earning first-team honors as a senior, while being named to 2008 A-10 All-Championship Team. Calathes finished his career with 1,251 points and currently ranks 34th on the Hawks’ all-time list, while his total of 630 rebounds is the 26th best in school history. A native of Casselberry, Fla., he still holds the SJU record for most consecutive free throws made with 38 in 2007. Dupree, who will go down as one of the top women’s college basketball players in Philadelphia history, ranks as the Temple’s all-time leader in field goal percentage (51.4%), stands third on the school’s career scoring list (1,698), third in rebounds (968) and is tied for second in blocked shots (218). A four-year starter, she was instrumental in helping the Cherry and White to its best three-year stretch in school history. Under her leadership, Temple won three conference titles, 73 games — including a school-record 25 consecutive contests — and appeared in the national rankings 27 straight weeks. Dupree, who recently became the second player in Temple women’s basketball history to have her jersey number (4) retired, was a two-time Atlantic 10 and Big 5 Player of the Year. She capped her collegiate career with Third Team All-America honors and was the sixth overall pick in the 2006 WNBA Draft. Dupree is in her 13th season in the WNBA and has been named an all-star six times. The Tampa, Fla., native was also a member of the US National Team that won gold at the 2010 World Championships. A three-time All-Big 5 selection, including a pair of first-team nods, Rezek stands as one of the top scorers and rebounders in Penn women’s basketball history. During her senior season, Rezek led the Ivy League in both scoring (19.7 ppg) and rebounding (12.7 rpg), with her 302 rebounds ranking seventh nationally. A three-time All-Ivy honoree and two-time team captain, Rezek still holds the single-game school record with 24 rebounds against American on March 2, 1993. She finished her career with a then-school record 972 career rebounds, which is now second all-time at Penn behind Diana Caramanico, and is sixth all-time at Penn with 1,265 career points. Rezek led the Quakers in both scoring and rebounding three times and registered 43 career double-doubles, also second all-time at Penn behind Caramanico. A native of Brooklyn, N.Y., Sumpter joined Villanova’s men’s basketball program in 2002 as part of one of the most acclaimed recruiting classes in program history. The class also included future All-Americans Randy Foye and Allan Ray, along with Jason Fraser. A two-time First Team All-Big 5 choice, Sumpter averaged 13.3 ppg from 2002-07. In 2004-05, he helped lead the Wildcats to the NCAA Sweet 16 with a 15.3 points and 7.2 rebounds per game average before injuring his knee in a Round of 32 victory over Florida. After suffering a second ACL injury in the preseason, the 6-7 forward redshirted in 2005-06 before coming back to earn First Team All-Big East and All-Big 5 accolades during 2006-07. All told, he completed his Villanova career in 2007 with 1,651 points and 794 rebounds and is among VU’s all-time Top 20 in both categories. Following his college career, Sumpter played professionally in Germany and France. In 2011, he was part of the squad that represented the USA at the Pan American Games. One of the most respected administrators in college athletics, DiJulia has overseen tremendous growth in the Saint Joseph’s University athletic programs during his tenure. This past year marked his 50th in college athletics and 35th as athletic director at St. Joe’s over two terms, from 1976-1981 and then from 1988 to the present. Over this time, DiJulia has overseen the addition of five varsity programs and a new weight training facility, the initiation of athletic fund drives, and the upgrading and creation of key University athletic facilities. While these accomplishments have been instrumental in the advancement of SJU athletics, it is the enhancement of the student-athlete experience that has been the centerpiece of DiJulia’s efforts. A 1967 graduate of Saint Joseph’s and member of the Hawk baseball and basketball teams as an undergraduate, DiJulia has worn many hats. His career began in coaching, with a one-year stint as assistant baseball coach for the Hawks in 1968. He went on to assistant basketball coaching positions at Fairfield University, George Washington University and American University. DiJulia left Saint Joseph’s in 1981 to become commissioner of the East Coast Conference, a position he held for two years before taking the commissioner’s job at the Metro Atlantic Athletic Conference from 1984 to 1988. This year’s Hall of Fame induction ceremony will be held April 16 at the Palestra. Ticket information is available through the five schools.